Of all the various roads and paths that snake their way through the countryside – A roads, B roads, byways and bridleways – it’s interesting to note that some ways are invested with a little more romance than the rest and by some ways, I mean green lanes and holloways. While ‘green lane’ is a catch-all for many different kinds of unsurfaced rural road or path – such as an old drove, a coffin road or a ridgeway – a holloway is a more specific term. It describes a sunken green lane, a track which was been worn down by the passage of thousands of feet, cartwheels and hooves over hundreds of years, even millennia. With the loosened soil subsequently washed away by the next downpour, the course of a holloway will often become more pronounced on the side of a hill because of the extra energy imparted by the surface water run-off. 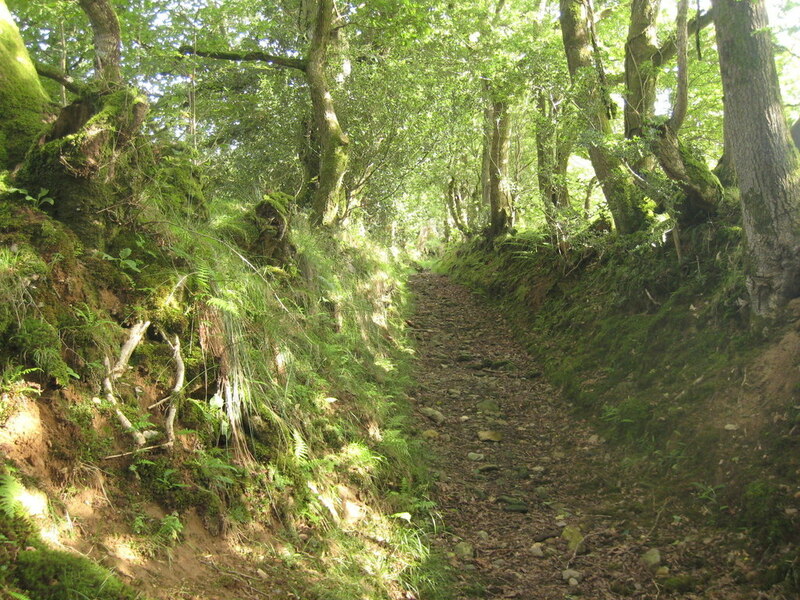 Holloways are common in lowland Britain with the greensands of the southern counties – Wiltshire, the Weald and the Chilterns – being particularly suited for their formation, as is the old red sandstone of the Wye and Usk valleys of Wales and the Marches, while the new red sandstone of south and east Devon has splendid, deep lanes on its slopes. Over time, as they are inscribed ever more deeply and the level of the lane lowers, they become more sheltered and trees arch over, creating a womb-like tunnel, an enclosed place of natural safety. So safe, indeed, that it’s only around this time of the year that the walls of foliage have died back enough to get into some old lanes, long-since-abandoned by changing patterns of passage over the land, bypassed in favour of a better route. Where holloways have fallen into disuse for even longer periods, they can be discovered anew – many centuries after they were last followed – by tell-tale shallow linear grooves through fields or woodland, though check that it’s not a short stretch of long-forgotten park pale or a defensive ditch, both of which will be accompanied by a bank above the natural ground level. Holloways have their own atmosphere, an unexpected quality which cannot be explained away purely in terms of the local topography or geology. As ancient routes, they are the perfect expressions of collective will, tracks which share a common origin with desire lines – those unpaved paths across city parks or shortcuts over open ground that urban planners never anticipated. As travelling long distances was more difficult in the past, the reasons were more keenly felt; every footstep has meaning on a pilgrimage and the burdens shouldered on a well-used coffin road were more than the purely physical.